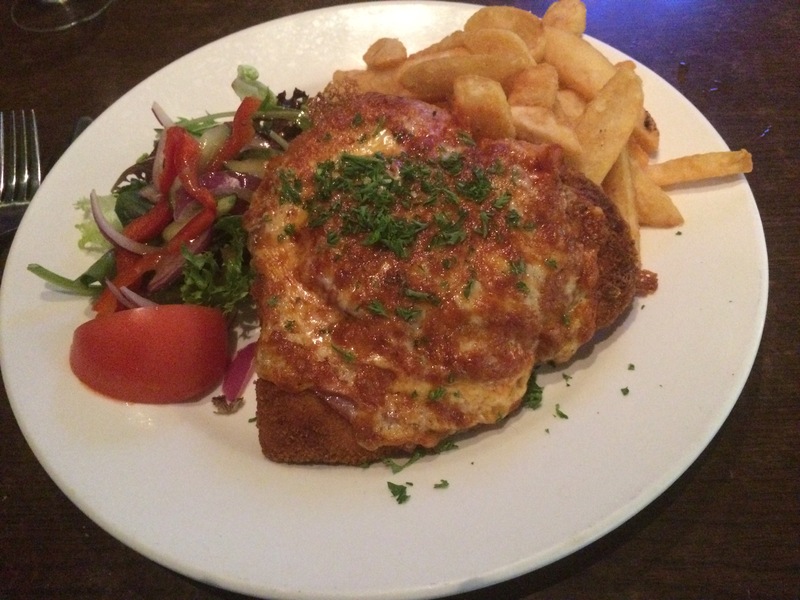 ← Parma Number 5: The Kenmore Tavern … when three cheeses still aren’t enough! Parma #6: Waterloo Bay Hotel … Holy Mosquitos Batman! We have a new leader! The Verdict: It has been commented to me of late that after 5 parmas so far I have not tested one that I thought was “really good”. Last night proved to be lucky number 6 as, finally, all the pieces of the Parma puzzle came together at the Waterloo Bay Hotel (Wynnum) in the form of a good chicken parmigiana! I received a number of comments on social media that this Parma looked like a good Parma. Equally I have to say that it is a dangerous game sometimes to judge a Parma by its photo, as previous reviews have shown, however this Parma proved to be just as good as its photo. Chicken: The piece of chicken (I have been suitably chastised in comments not to refer to it as a chicken breast) in the Waterloo Bay Hotel Parma was perfectly cooked and tasted great. If I had to be critical (and I am struggling to find things to be critical about) I would say that the chicken was a touch over crumbed but this did not take away from just how good the chicken itself was. Tomato Sauce: Finally a Parma with an even covering of a good tomato sauce. This sauce was very tasty and there was enough of it so that I had some with every bite of the Parma. Ham: It has been a regular complaint of recent parmas that the ham has really let those dishes down. I was overjoyed to have a piece of ham last night that was not folded into an origami animal and that covered a significant portion of the chicken breast. It did not quite cover the whole piece of chicken but was close! Cheese: After last week’s three cheese Parma it was alway going to be hard for next Parma to stack up in the cheese department. That said the cheese on last night’s Parma was well spread across the chicken and complimented the other parts of the meal well. Side Dishes: I really enjoyed the salad last night but I confess that might have been because the salad inclusions focused on vegetables that I like. Lettuce, onion and capsicum dominant salad is always going to win me over. The chips were mostly good albeit some suffered I think from being stuck under a corner of the chicken and were a touch soft. Those that weren’t were crisp and well cooked. The presentation: this Parma came out on a large enough plate but again the chef could not avoid having a few chips under the the chicken. It did affect the meal as noted above. One day someone is going to get this right and if the stars align they might win the “Robert Parma”. The Venue: The Waterloo Bay Hotel is in Wynnum on Brisbane’s bayside. We sat in the outdoor area of its restaurant and took advantage of the buy one main get another for $5 deal on offer which made value for money on the night excellent. The staff were wonderful. My only fault of the venue, and one that they can’t really help, was the attack of the mosquitos that hit almost from the moment we sat down till the end of the meal. I was worried at one point that a swarming horde of them was going to fly away with my chicken! Not the hotel’s fault but worth remembering! The Wash Up: Finally a good chicken parmigiana … What a relief!!! Obviously there is some room for improvement in this Parma but credit where it is due it was a good one. If you are in the Wynnum area definitely drop in on the Waterloo Bay Hotel for a Parma just don’t forget your industrial strength insect repellant if you are thinking of sitting outdoors! This entry was posted in Uncategorized and tagged brisbane's best, brisbane's best parma, Parma, waterloo bay hotel. Bookmark the permalink. 1 Response to Parma #6: Waterloo Bay Hotel … Holy Mosquitos Batman! We have a new leader! A dangerous game indeed, to judge a parma by its cover. Success at last though!